The B&G Ultralight Fogging Machine is THE industry standard fogger and ULV misting solution ! Designed for fogging large indoor areas such as homes, restaurants, bakeries, attics, crawl spaces, etc. For cockroaches, fleas, food product pest such as grain beetles, and weevils, fabric pests such as clothes moths, and even flies, carpenter ants, drywood termites, silverfish, etc. The B&G Ultralight Fogging Machine is the industry standard fogger and ULV misting solution. Easily apply Pyrethrin fogging solutions into large enclosed areas. The B&G ULV Fogging Machine easily adjustable output allows the user to choose between a light mist or a heavy fog. Plus it applies the proper airborne amount every time ! Be sure to wear a respirator and eye protection when using this piece of equipment. * Variable flow from ULV (ultra-low variable) to light mist. * 2-stage motor for good reliability. * Adjustable flow rate from 0-9 oz/min. * Versatility for many fogging applications. * Tank is rotationally molded of a seamless design for maximum strength. 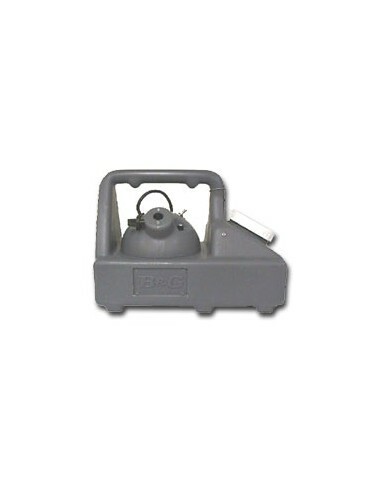 * 1 1/2 gallon capacity with 3 1/2" wide tank opening & low profile for stability. * Corrosion resistant materials for use with many chemicals. * Applies the proper airborne amount every time! * Be sure to wear a respirator and eye protection when using this piece of equipment. Use on cockroaches, fleas, food product pest such as grain beetles, and weevils, fabric pests such as Clothes Moths, and even flies, carpenter ants and drywood termites. silverfish, etc. B&G ULV Fogging Machine Size: 18"x 9"x14"
B&G ULV Fogging Machine Manufacturer: B&G Chemical Co.